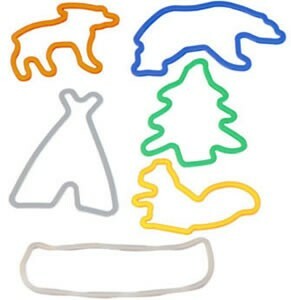 In an earlier post, I mention that there is a current craze going on about these animal shaped rubber bands bracelets most known as Silly Bands. These rubber band bracelets are the latest kid fad that has kids are going nuts over them. After looking at these rubber bands, I really didn’t understand the reason to why kids are going mad over them. BUT then I realized. I started to look through some of my old pictures of when I was a kid. And I immediately noticed a common theme, something started to show up in several pictures. I wasn’t necessarily the same object, but it was the same type of product. It was a Cardboard box. Why was this? It really became clear to me that my childhood best friend was boxes, I loved them. I played with them, made things with them, and of course wore them as shoes, the ole’ six pack shoes, boy those were the days, then in a blink of an eye, it hit me. We as kids do not need those expensive toys to keep ups occupied or busy. Our imagination can run wild with the simplest things, and to me it doesn’t seem to be a surprise that Rubber Bands are making the kids go nuts everywhere. Children can find happiness with the littlest things no matter what that might be, I guess that is the beauty of children. So now it doesn’t surprise me to why kids, love these little animal shaped rubber bands bracelets!! !